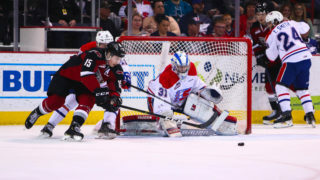 Tonight at the Langley Events Centre, the Vancouver Giants look to wrap up their January home schedule on a winning note when they take the ice against the Kelowna Rockets for the second game in as many days. 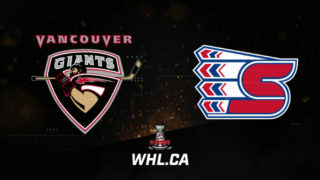 Last night the Giants defeated Kelowna by a 2-1 score, improving their record to 31-12-2-0 and their record against the Rockets to 4-0. The Giants have won eight straight and currently lead the B.C. Division standings by 14 points. The Kelowna Rockets hold just a one point lead over Kamloops for a top three playoff spot in the B.C. Division standings, which means there will be no shortage of urgency on the Rockets side of the ice tonight. 2000-born forward Nolan Foote has scored at least one goal in each of his past three games. The third year forward from Englewood, CO leads all Rockets with 25 goals and his 45 points rank him second on the team in scoring. 13 of his 25 goals have come via the power play. Foote’s previous season high for goals was 19 and for points it was 40. 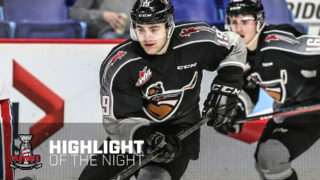 Selected by the Rockets in the second round (42nd overall) in the 2015 WHL Bantam Draft, Foote is expected to be selected in the early rounds of the 2019 NHL Draft. 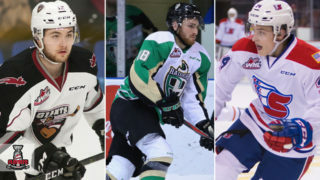 He was one of three Kelowna Rockets participants who suited up in the 2019 Sherwin-Williams CHL/NHL Top Prospects Game. Of the three goals that the Kelowna Rockets have scored against the Giants this season, Nolan Foote has scored two of them. Last night’s result could have been much different had the Rockets not received stellar goaltending from 2001-born Vancouver product Roman Basran. The 6’2”, 193-pound netminder made 37 saves in last night’s game and received first-star honours for his efforts. Basran brings a 13-14-1-0 record into tonight’s game with a .902 save percentage and a 3.02 goals-against-average. Basran has played in all four games against the Giants this season, and despite his 0-4 record his goals-against-average is 3.07 and his save percentage is .910. 1999-born forward Kyle Topping comes into tonight’s game ranked first on the team in scoring with 17 goals and 32 assists for 49 points. The third-year forward from Salt Spring Island has two goals and three assists for five points over the course of his past five games. Recently Topping was ranked #185 on NHL Central Scouting’s Mid-Term Rankings List. Not bad for a player selected by Kelowna in the 11th round of the 2014 WHL Bantam Draft. Last Game: A 2-1 victory over Kelowna on the road last night. It’s been an incredible month of January for Bowen Byram. The Cranbrook, BC native has scored eight goals and added eight assists for 16 points through 11 January games. Back on January 12th at home against Kamloops, Byram became the first ever Vancouver Giants defenceman to record five points in one game. Last night Byram broke open a 1-1 tie with his 17th goal of the season which came on a power play late in the third period. Byram now has 17 goals and 27 assists for 44 points which ranks him fifth among all WHL defencemen. His 17 goals though are tops among all defencemen both in the WHL and CHL. Earlier this week Byram suited up for Team Cherry at the 2019 Sherwin-Williams CHL/NHL Top Prospects Game. Bowen Byram is considered a top prospect for the 2019 NHL Draft. 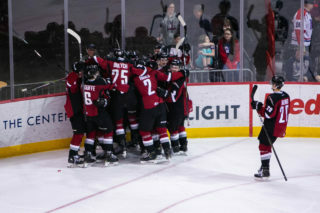 The Vancouver Giants currently hold a record of 15-3-1-0 record against teams in the B.C. Division, which is a huge reason for their 14-point lead at the top. The Giants are 4-0 against Kelowna this season and are 1-0 against the Rockets at the Langley Events Centre. Only the Victoria Royals and Prince George Cougars have managed to defeat the Giants in regulation at home. David Tendeck’s next appearance will mark the 100th of his WHL career. Davis Koch is just two game shy of 300 for his WHL career. Jared Dmytriw is seven games shy of 300 for his WHL career. Dylan Plouffe is 10 points shy of 100 for his WHL career.